A new column is created and populated in Salesforce, but the Salesforce credentials used by CopyStorm cannot see the column. When permissions are changed and CopyStorm can see the column, any data populated prior to CopyStorm having visibility will be null and the data will need to be propagated. A column contains a formula whose value changes without the timestamp on the row changing. 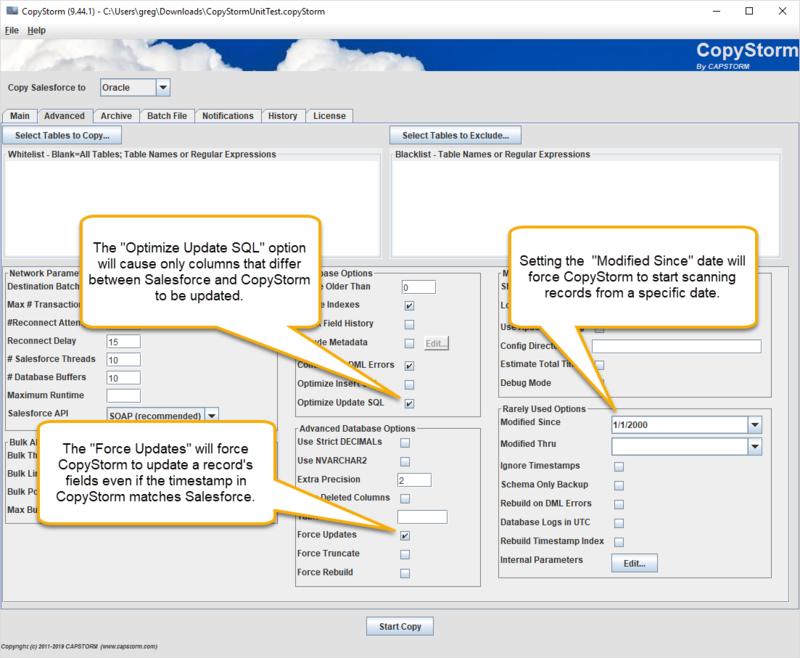 If you know the specific columns that need to be updated, the fastest approach is to use the CopyStorm/Medic RefreshColumns tool. However, if you are not sure which columns are out of sync or if you want to check all columns, the fastest approach is to use CopyStorm. Verify that the “Optimize Update SQL” option is checked (it is by default). When this option is checked columns whose values differ between CopyStorm and Salesforce will be updated in the database. Enable the “Force Updates” option. When this option is checked, CopyStorm will do a field-by-field comparison between CopyStorm and Salesforce records even when the two timestamps match. Enter a date into the Modified Since parameter that is earlier in time than when the data sync problem is believe to have occurred. For example, if a new column was introduced on 16-Mar-2017 and permissions were fixed on 21-Mar-2017 then only records modified after 15-Mar-2017 need to be scanned. Now run CopyStorm — any fields that do not match will be updated and matching fields will be left untouched. Do not save changes to your CopyStorm configuration file.